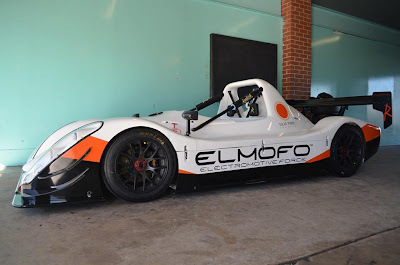 Following a 12 month build process the Electric Radical SR8 built by Newcastle based ELMOFO will be doing laps at Sydney Motorsport Park (Eastern Creek) tomorrow (14th July) at 9:50am piloted by multiple time Australian Motorsport Champion John Bowe. The past week has been spent ironing out some minor bugs identified during last weeks test session. The car has been back on the dyno and can now boast an ideal torque/power curve and a new top speed setting. John Bowe will be out to set an Electric track record for Eastern Creek, but the Electro Motive Force Racing Teams objective is to better some other existing lap records. EV News has been invited to witness the record attempt so will post updates on Twitter as the records tumble.